My heart has been on the ground. Please share these articles about the horrific attack on water protectors on Thursday at the new Treaty Camp which was established on the path of Dakota Access Pipeline. 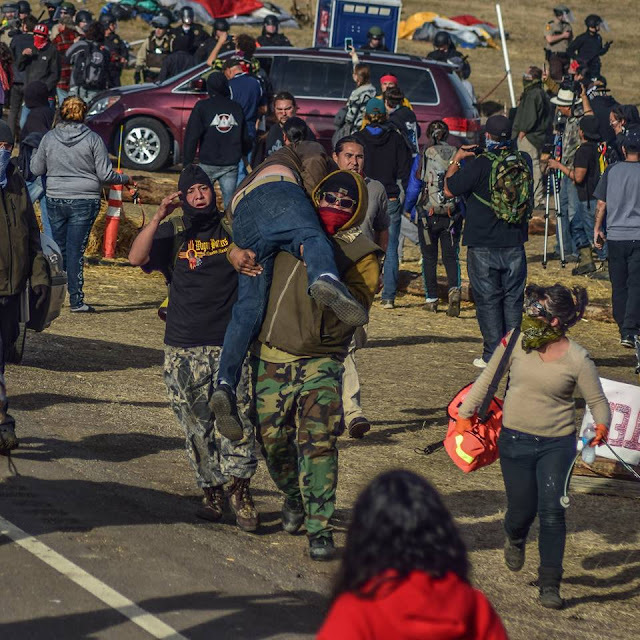 The Standing Rock water protectors were beaten with batons, pepper sprayed, tear gassed, shot with rubber bullets, hit with sound grenades and tasers. They were jailed in "dog kennels" and marked with numbers, as was done in concentration camps, at Morton County jail. More than 100 were arrested, even elderly in ceremony, and sent to jails throughout North Dakota, making them difficult to find. 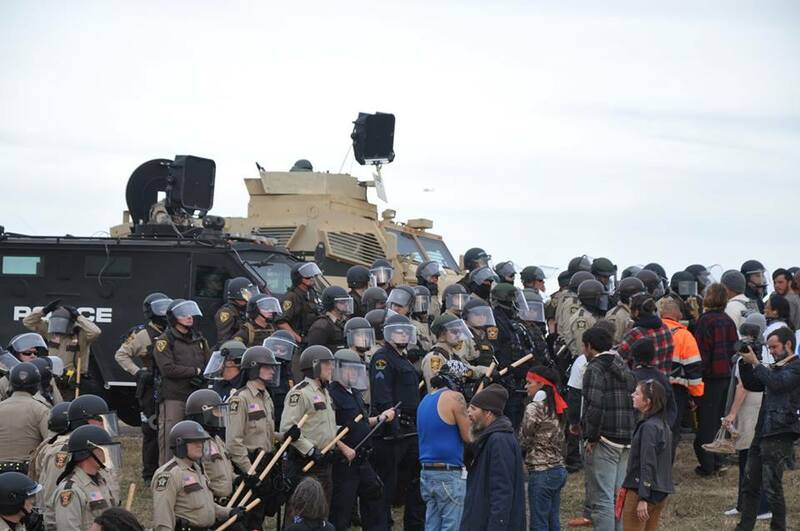 The same day, a member of DAPL security charged into camp, attempted to kill the people by running over them. He was armed with an assault rifle. The warriors chased him to disarm him. He was arrested by the BIA. His DAPL employee documents were in the truck. One person in lockdown was hooded. A woman in jail was forced to remain naked. On Saturday night, a grassfire raged throughout much of the night near the Standing Rock Camps. It was eventually put out and everyone was reported safe Sunday morning. Censored News is published with no ads, grants, salaries or revenues. It was created after Indian Country Today censored, and fired, longtime staff reporter Brenda Norrell. Created to give a voice to Indigenous Peoples and human rights struggles, today it is a collective of writers, photographers and media, all sharing their labors of love. Censored News is now in its 11th year and approaching 12 million pageviews. All content copyrighted by individual photographers, writers, radio producers and videographers. How and why are Americans using so much energy? Don't kill indigenous people so you can walk around your house naked in the winter, or set the air conditioner to freezing in the summer, or where newly washed jeans everyday. Social courtesy, environmental friendliness, kindness not killing. The illusion of the privileged life where everything is squeaky clean, climate controlled, and all the dishes match the decor comes with a high price tag: the future of our children and families. Germany is using solar for 50% of its energy consumption. Why, if America such a great country, is it living so far behind times? American citizen stand up for your environment, health, and Future! The water and land protectors are standing up for you. Be willing to find a good way to care for Mother Earth.